VoIPSter has announced the formation of The OpenZoep Foundation and the release of OpenZoep communications engine. The OpenZoep communication protocol is based on the XMPP Extensible Messaging and Presence Protocol, an open, XML-based protocol for near-real-time, extensible instant messaging and presence information, which happens to also be supported by Google Talk. It also is the core protocol of the Jabber Instant Messaging and Presence technology used by thousands of Jabber servers. According to VoIPSter, "OpenZoep will enable the proliferation and rapid development of standards based telephony application throughout the world as VoIP grows and continues to take hold with users and service providers." They added, "OpenZoep wants to become the de facto open source VoIP solution that is embedded in software clients, web browsers, games and other mobile or desktop applications," said founder Sjoerd Hannema, CEO of VoIPSter. "With OpenZoep all applications can immediately begin offering free PC-to-PC VoIP calls, instant messaging (IM) and both outbound PSTN and SIP calls to free and premium SIP based telephony providers." "Building VoIP clients using OpenZoep is very straightforward," said Dirk Griffioen, VoIPSter's Senior VOIP Engineer. "The OpenZoep API offers simple methods to communicate with the OpenZoep client-side VoIP engine and server-side web services." In any event, in collaboration with leading directory providers, OpenZoep will also introduce an initiative to establish a global service provider discovery server. This server allows end-users to pick and choose a service provider that offers PSTN in, PSTN out, voicemail and other telephony services from thousands of Internet Telephony Service Providers. "Already awkward interoperability issues are plaguing the IM industry. Those issues should be avoided at all cost in the VoIP market," said Sjoerd Hannema. "OpenZoep's founders feel it's not too late to promote open VoIP standards, even when some major players already have adopted proprietary protocols." OpenZoep has also added so-called XMPP 'stanzas' for working with sound cards, mics and speakerphones as well as other audio input and output devices. These ‘stanzas' simplifies the handling of phone calls and provides easier access for getting configuration information from the engine by making it easier for developers to work with. 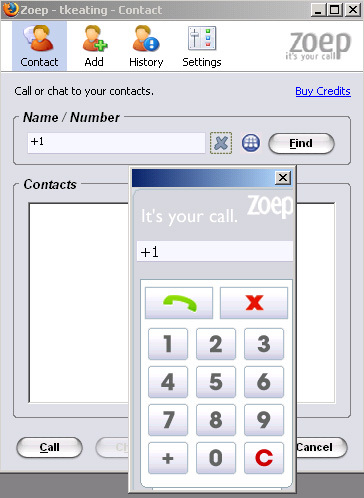 With a mission to keep VoIP open and secure, OpenZoep believes computer-based telephony should be based on open source software. Only publicly accessible software allows the open source community to scrutinize the code for safety and quality. "Since OpenZoep uses Jabber for its presence and instant message handling, it is possible to search for users on other Jabber networks," said Griffioen. "This means user of OpenZoep based applications can benefit from a shared, global telephone directory. To accomplish this OpenZoep will pursue cooperation agreements with leading IM Federations and providers." They even feature a Zoep Firefox plugin which adds the client to the Firefox toolbar. 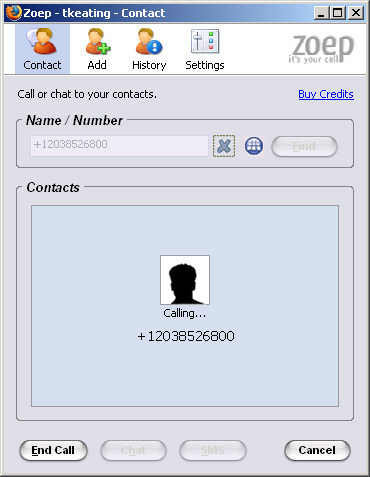 I wonder if this is the first VoIP Firefox plugin? In any event, I installed it and played around with it a bit. Just a warning if you do install this Firefox plugin and you use the Firefox SessionSaver plugin -- it crashed my Firefox and I lost all my saved tab windows. :( Well, I was able to recover them in the prefs.js file, but I had to manually copy/paste each URL one at a time back into Firefox. So forewarning - you can Bookmark your open tabs to a backup group just to be safe before installing this. Error I got with my initial password I chose. Must have at least 1 capital letter and 1 lowercase letter and 1 digit? Boy, talk about strict password security! Making a call. Note the "+1" required in the dial string. I had no credits, so I couldn't test the audio quality. I'm not even sure why it attempted to dial when I had no credit. You'd think it would save "Please click here to buy credits" or something to that effect. With OpenZoep's any service provider could provide PSTN, voicemail, SMS and other services by following the open standards.By striving for top-notch speech quality, security, and openness; OpenZoep plans to support as many platforms as possible; by offering any version on any platform that is backward compatible for at least all telephony functions. The OpenZoep engine is currently available for Windows, with versions for OS X and Linux being ported. Using OpenZoep based applications also means user may choose the service provider of his/her liking, while each service provider remains responsible for billing and customer support of their respective customers. Additionally, all providers will use one shared central OpenZoep/SIP directory that allows users to discover and invite friends and colleagues. Blink, Best Damn SIP Client You Never Heard Of!